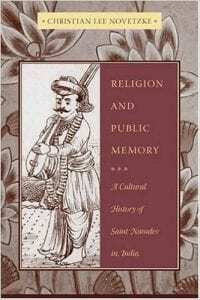 My first book, Religion and Public Memory, was published in 2008 and is a cultural history of the public memory of an Indian “saint” or sant named Namdev, who is remembered to have lived in the 13th century, and who is recalled at various points in time and in various places in India and outside India by people who used him to comment on their various “presents”. I trace this memory of Namdev in Indian history from the 13th Century to the present. The book was also published in India in 2009 by Permanent Black with the title, History, Bhakti, and Public Memory. The book won an award from the American Academy of Religion in 2009 called The Best First Book in the History of Religions. 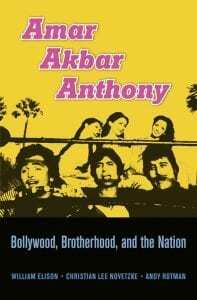 My second book, co-authored with Andrew Rotman and William Elison, is on the Bollywood classic Amar Akbar Anthony published by Harvard University Press in 2016. My third book, The Quotidian Revolution, published by Columbia University Press in 2016, examines religion and the cultural politics of vernacularization in 13th Century Maharashtra and the creation of the public sphere in India. 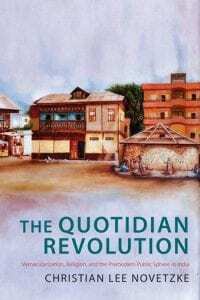 The “Preface” and “Introduction” of The Quotidian Revolution is available for download here. Here are most of my articles. For a complete list, see my c.v. The most up-to-date collection of my articles is at my Academia.edu website. “The Brahman Double: The Brahminical Construction of Anti-Brahminism and Anti-Caste Sentiment in the Religious culture of Pre-Colonial Maharashtra,” South Asia History and Culture,. Vol. 2, No. 2, April , 2012: 232-252. “Bhakti and Its Public,” International Journal of Hindu Studies, Vol. 11, No. 3 (December 2007): 255-272. “The Theographic and the Historiographic in an Indian Sacred Life Story,” Sikh Formations, Vol. 3, No. 2 (December 2007): 169-184. “The Subaltern Numen: Making History in the Name of God.” History of Religions, Vol. 46, No. 2 (November 2006): 99-126. “The Study of Indian Religions in the US Academy,” India Review, Vol. 5, No. 1 (January 2006): 91-121. “The Laine Controversy and the Study of Hinduism,” International Journal of Hindu Studies. Vol. 8, Issues 1-3 (2004): 183-201. “Divining an Author: The Idea of Authorship in an Indian Religious Tradition,” History of Religions, Vol. 42, No.3 (February 2003): 213-242. “Twice Dalit: The Poetry of Hira Bansode in Translation,” Journal of South Asian Literature. Vol. 28, Nos. 1 and 2 (Spring 1995): 279-96. “Humanism, Religion, and the Nation: Sant Namdev as a Mānavatāvādin” in Speaking Truth to Power: Religion, Caste, and the Subaltern Question in India, edited by M. Bhagavan and A. Feldhaus. Delhi: Oxford University Press, 2008, pages 30-46. “History, Memory, and Other Matters of Life and Death,” in Shared Idioms, Sacred Symbols, edited by Kelly Pemberton and Michael Nijhawan, 2008, pages 212-232. “Memory” for Studying Hinduism: Key Concepts and Methods. London and New York: Routledge, 2007: 230-250. “Subaltern” for Studying Hinduism: Key Concepts and Methods. London and New York: Routledge, 2007. Co-authored with Laurie Patton: 378-390. “A Family Affair,” for Alternative Krishnas, edited by Guy Beck. Albany: State University of New York Press, 2005: 113-138.